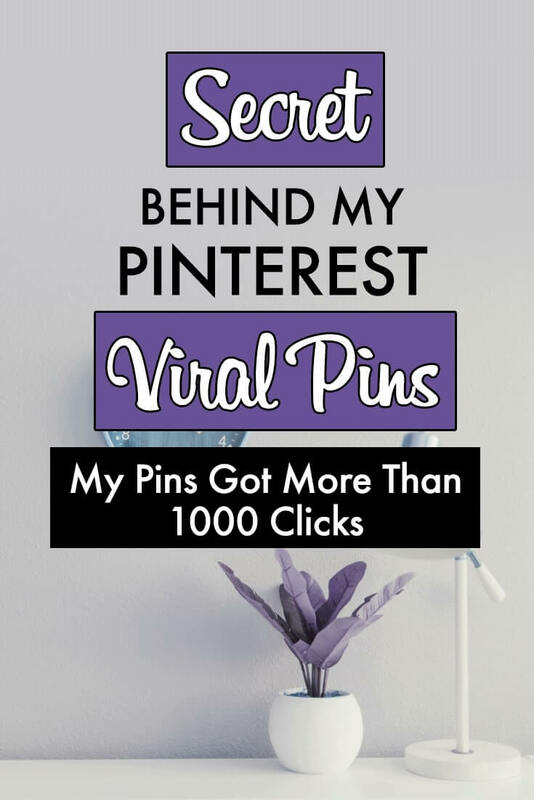 In this post, I will share my experience of how my pins are going viral and driving me tons of traffic. I know you might have not seen any of your pins getting viral yet and probably, seeking for the secret remedy. Well, to be honest, there is no secret remedy for such pins. If there would have been, then each and every pin you create would have gone viral. I have seen my worst pins getting viral when I’ve least expected it. This means, even if you create the most beautiful pin, you can’t predict whether it will go viral or not. So, the best thing you can do is follow the right strategies and the right design that can surely give you higher chances. If someone is saving your pin in their most engaged boards, there is a higher chance that you’ll start getting tons of traffic. 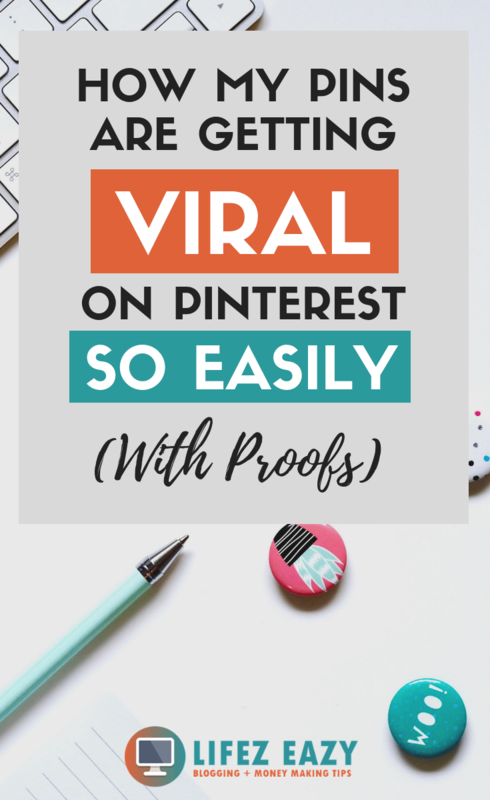 As per my experience and what I have seen, my pins only went viral when a good pinner repinned my pin in their best-keyworded board which has a lot of engagement. If it had been saved in a less engaged board, I would have not seen the same result. Now, you can’t control the audience who will repin your content. They will save it on whichever board they like. So, the best thing you can do is target the right keyword with right pin design along with a compelling title. Targeting the right keywords will make sure that your pin shows up to the right people who are interested in the same topic. Now my question is how are you going to learn all such things? Well, that’s what I am going to discuss here. So, make sure you stick till the end. I will be showing you all the screenshots from my viral pins along with its analytics. So, if you are keen to know how I got such a result, then keep on reading. When I started using this platform, I was way much confused about it. All I can see is bloggers creating images and sharing them on Pinterest. In this way, they were generating traffic to their blog. I thought that it looks quite easy and started doing the same. After doing it for one month, all I could see is 10-12 visitors per day. I mean, it was saddening to see only 10-12 visitors after doing a heck lot of work. At that point, I gave up on Pinterest and started investing my time on Facebook, Twitter & Google Plus. Though I was getting around 20-30 visitors per day from it, still, it was way too less as a blogger. I use to visit Pinterest once or twice a week to read the different post. As I love reading income reports, I always use to read them to keep myself motivated. 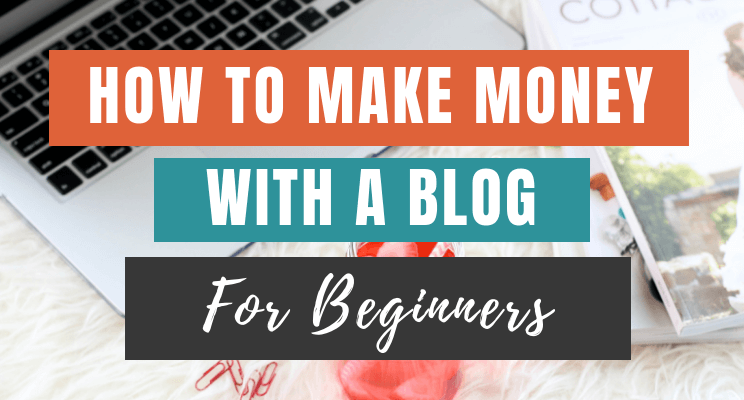 There were bloggers who were making $1000 – $3000 per month with ease and guess what, what was their source of traffic? This really made me think that I might have implemented the wrong strategy. That is why I wasn’t seeing any result. I read numerous articles on Pinterest just to crack the code. All of them talked about the same thing. Even, though, I already implemented those things on my blog but still, didn’t had any success. However, there was one particular thing that I saw repeatedly. No, it wasn’t any strategy. Actually, it was “Billionaire Blogging Pinterest Manual“. Whoever got success from Pinterest, they always mentioned this ebook. I already knew that the links pointing to this book are affiliate links and they are trying to sell this ebook to make money. However, I gave a second thought to check their sales page. I read all the description along with proof. 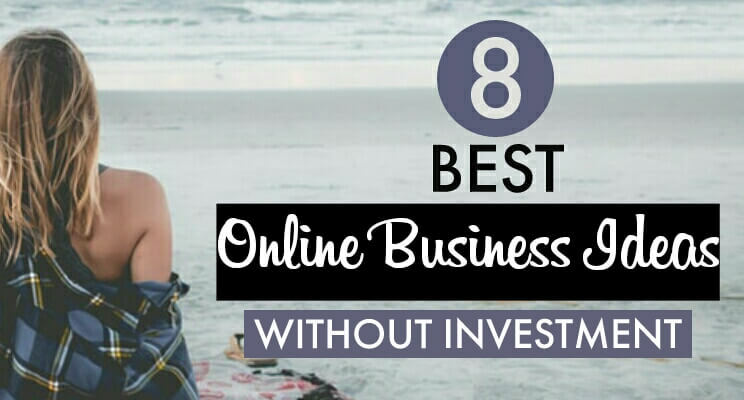 For me, proof’s are very important if I want to buy any stuff online. Thankfully, I was convinced and bought it. That’s when my Pinterest game changed. Edit: Currently, I am using both Pinterest Manual & Pinterest Strategies which have really skyrocketed my traffic. 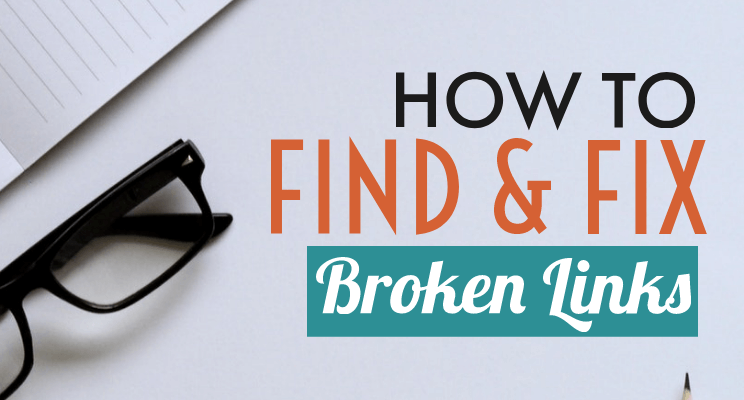 You can read my honest Pinterest Strategies review here. So, I bought & read this book almost 3 times to consume all the information. By the way, it is a 165-page ebook which has a lot of information. It took me around 40 minutes to read it for the first time. I made a few notes so that I won’t forget all the necessary points. 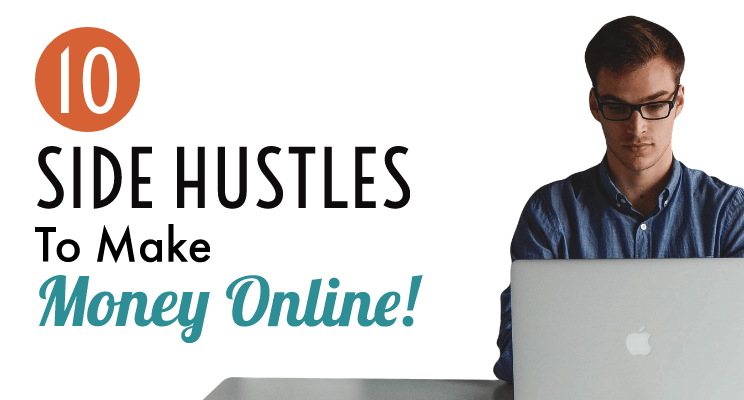 Let me tell you, his strategy is applicable to any niche who wants to see Pinterest traffic. Whether you are a newbie or intermediate Pinterest user, this book is made for all of them. Now, I just don’t wanna talk, I will actually show you the result which I got after applying all the tactics. But before that, let me tell you that my blog niche is Online Marketing where I talk about blogging, SEO etc. Now, this niche has less audience compared to food, health, lifestyle, DIY niche. 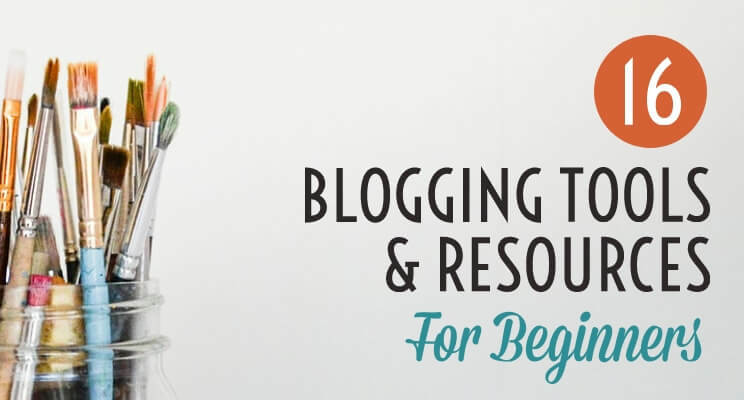 My niche is only for bloggers who want to start blogging. I mean those who are not into blogging won’t be reading my content. 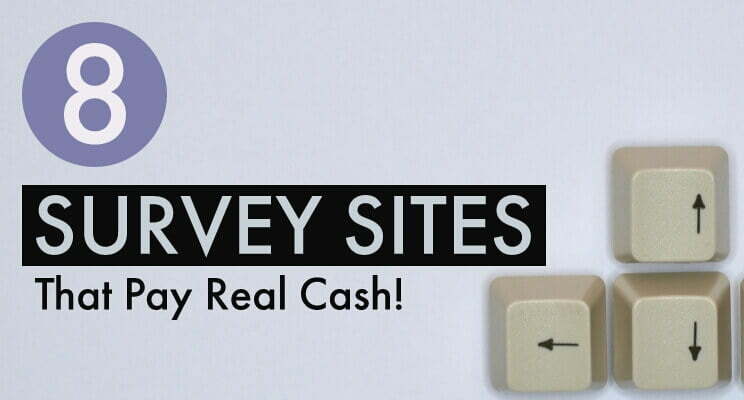 Edit: I have also included “online money making niche” on my blog. 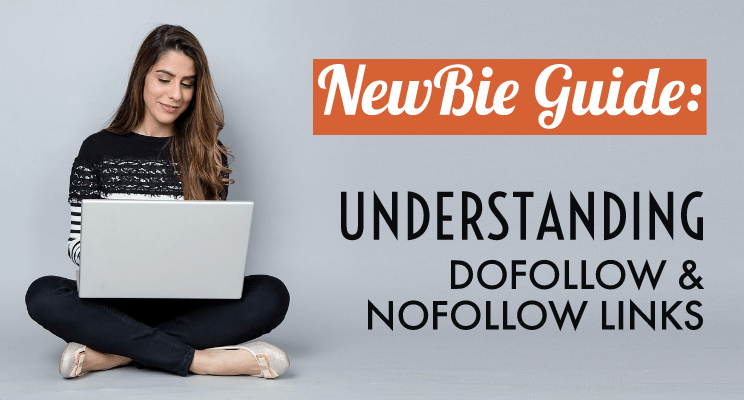 Whereas the above niches have a broad audience which means they have better chances to drive more traffic from Pinterest. 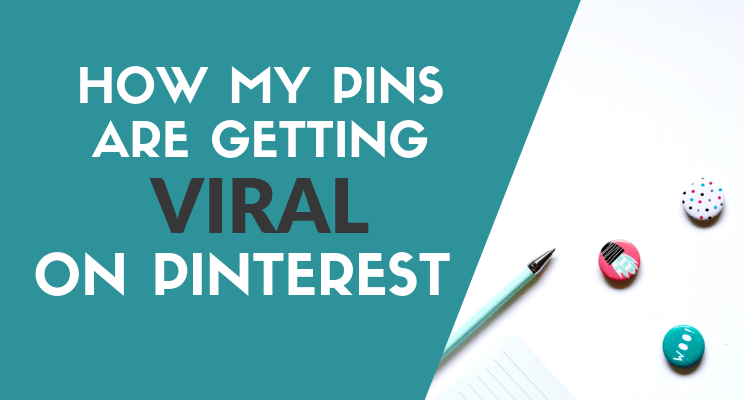 So, it was kinda difficult for me to have a viral pin with the limited Pinterest audience. But, the result I got is actually pretty good if I compare it with my niche. I always think that what if I had a blog in food, health or DIY niche, I am pretty sure that I would have been hitting big numbers. Anyways, enough talk lets get to the point. After reading the Pinterest Manual, I made a new pin for one of my older posts & started pinning it as per the strategies mentioned in this book. After 1 week, one day I was just getting ready to sleep. Now before sleeping, I always check my traffic analytics to see if any miracle has happened. To my surprise, I saw 50+ visitors online on my blog. I was dumbstruck and checked the traffic source & page. To my surprise, it was Pinterest which was earlier giving me 10-12 visitors per day and the page was the same whose pin I created earlier. I started getting 600-800 visitors per day with just one pin. Obviously, it had several other versions as well which brought me the traffic. But as you know, Viral pins has a limitation. If a pin went viral, they will be viral for a few days and then they come back to normal. But, currently its September and it still gives me 100-150 visitors per day. 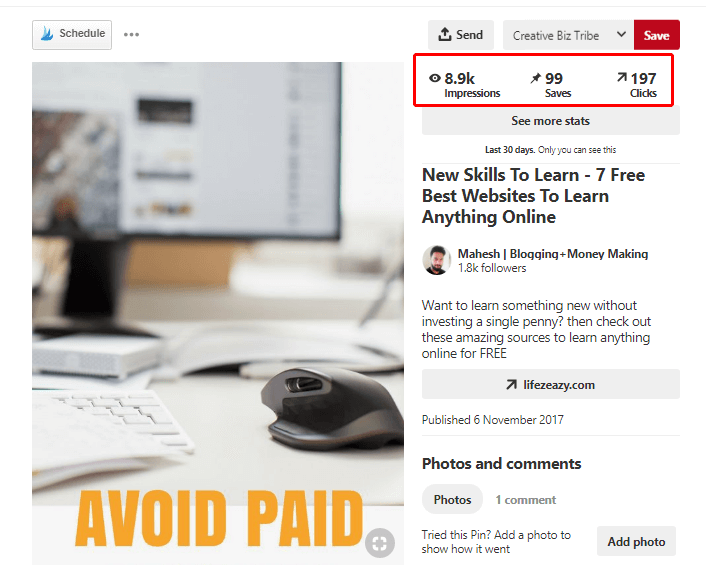 Edit: It started giving me more than 200 visitors per day when I started applying the “Pinterest Strategies” method. 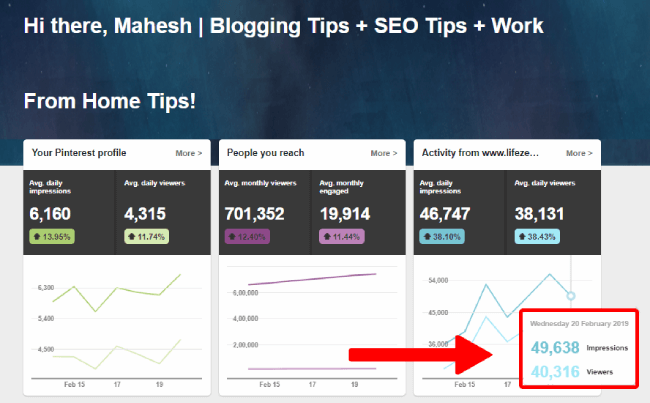 Overall, I am still growing this pin which is bringing me consistent traffic every day. All credit goes to Pinterest Manual. 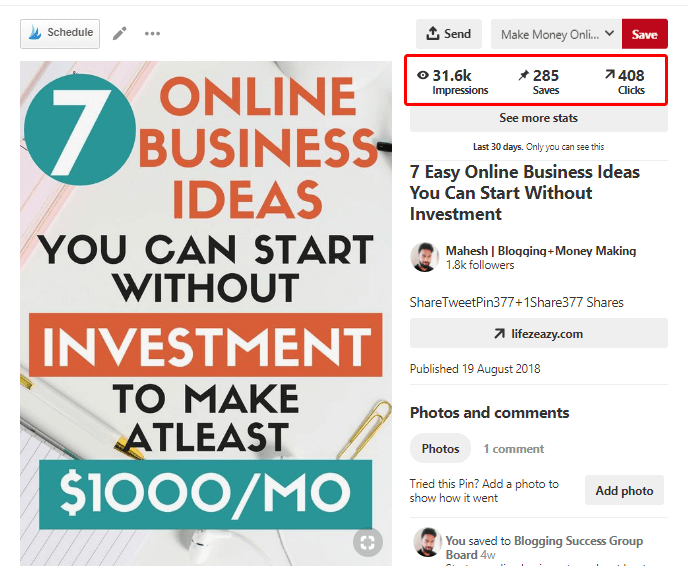 Even if you don’t have any viral pin, his techniques will teach you to generate consistent traffic from Pinterest which don’t get vanish. As you can see below, in the last 30 days, my viral pin has an impression of 50.8k which means that 50.8k people have seen my pin. Along with that, I got more than 1,100 clicks i.e more than 1,100 visitors visited my blog in the last 30 days only with this pin. Though the clicks are less compared to the impression, it is only due to the headline which isn’t much compelling. Otherwise, those clicks would have been at least 5k-6k. Now, the fun part is this pin has several other versions which are created automatically by other Pinterest users during their pinning process. The other versions are also driving me traffic on a daily basis. If you look at the below version, this pin has got 9.5k impression in the last 30 days and from that, I got 264 clicks. This is another version which has got 8.9k and has given me 197 clicks in the last 30 days. Now, there is more than 10 version of this pin that is giving good consistent traffic on a daily basis. 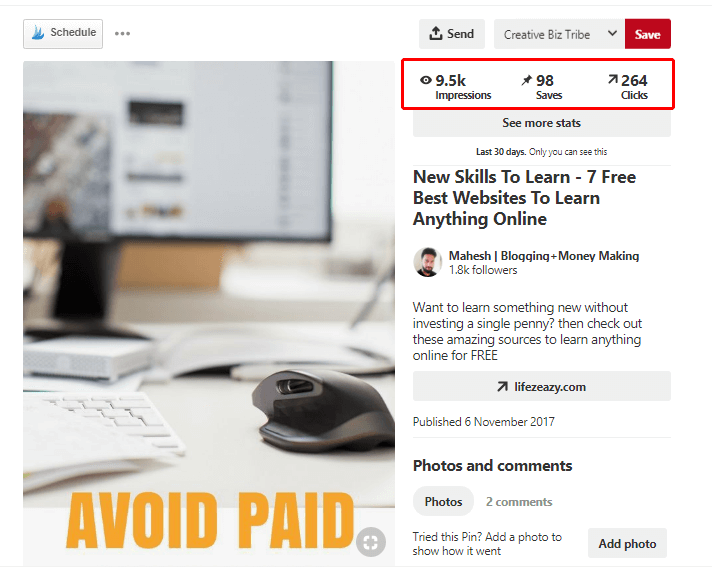 But the story doesn’t end here, this viral pin is currently ranking at the top for keywords such as “Paid Courses” & “New skills to learn” which has a high search volume on Pinterest. So, it is also giving me organic traffic as well. There are many other versions of this pin as well that are getting clicks on a daily basis. I will also include one more pin as shown below. This pin is also catching up and giving me good traffic. I will be further growing it more to increase those impressions & clicks. Now, there are more pins like this which are doing wonder for me. I was amazed to see the result which I could not have done if I didn’t know how to strategically use Pinterest. 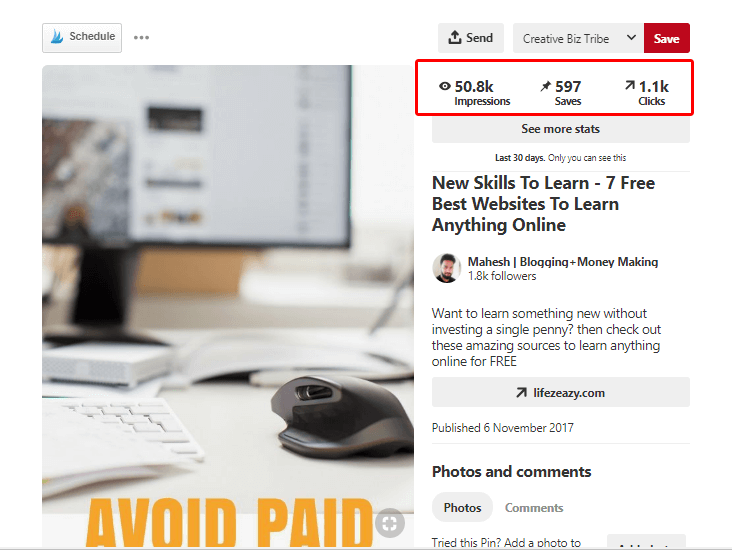 Though I have applied his techniques in only 10 blog post till now which I newly created excluding just one which is an older post (I have a total of 54 articles on my blog) and it is giving me an amazing result. I will be planning it for my older posts as well in the coming days and I hope to drive more & more traffic from it. Right now, whenever I write a new post and start pinning it on Pinterest, I immediately get a good number of clicks within a week. But before that, I used to work so hard but still manage to get a few clicks. So, its a lot of improvement to be honest. 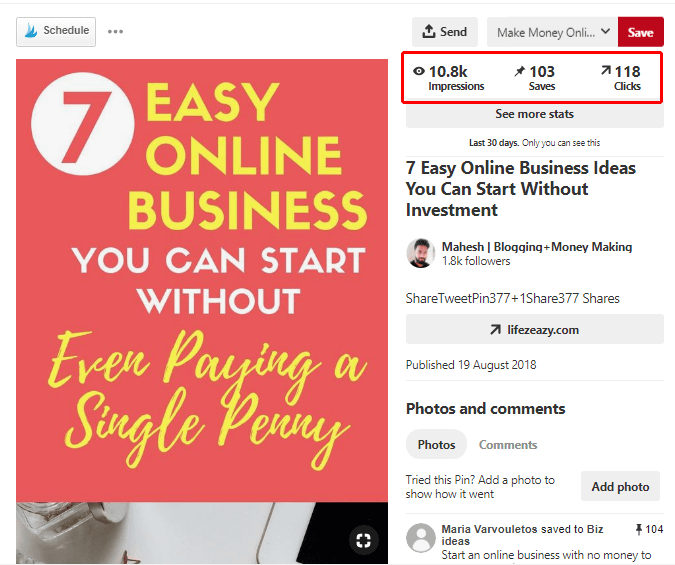 Now, I will just share with you a basic strategy that is talked about in every Pinterest course. However, I will tell you a pretty basic thing that you must follow to increase your chances on Pinterest. You won’t get clicks if you don’t have impressions which means the more your pin is shown, the higher the clicks you will get. So, when you create a pin, you need to work on these factors. Now, you might be thinking that how can you generate such impressions? It’s simple, you need to keep pinning your pin in different group boards & your own boards. There are some bloggers who repin their pin only a few times and when they don’t get clicks, they stop pinning it. This absolutely must be avoided because you never know when your pin is going to kickstart. I had pins which took 1-2 months to actually show me some result. Now, it’s kinda difficult to carry on such pinning activities manually if you have a lot of pins. 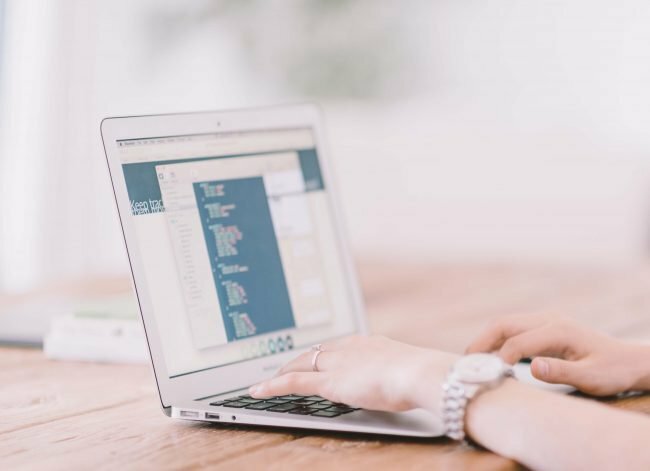 So, make sure to use schedulers such as Tailwind to automate your pinning process. 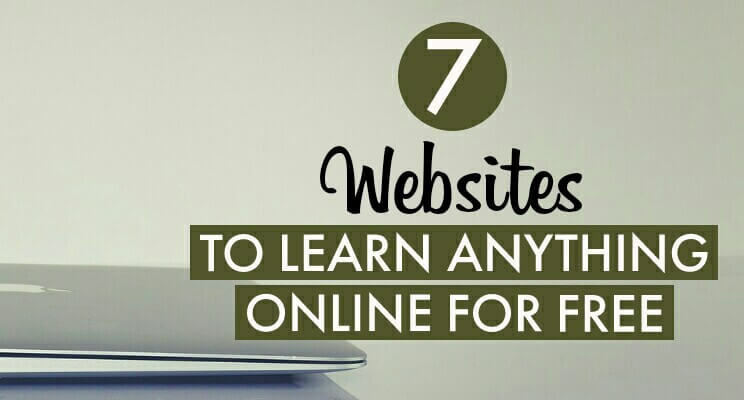 Believe me, it will help you a lot and save a heck lot of time if you have a busy schedule. Also, make sure that you have enough boards (both personal & group board) to carry on your pinning activity because if you have fewer boards, then you can’t repin your same pin on the same board every week. You may get banned from group boards if it is against their rule. Due to this, many group boards have rules to repin the same pin after 30 days. That is why make sure you have enough boards to carry out your pinning process without repeating. I myself have a total of 88 boards out of which 45 boards are group boards and rest of them are my own. I am still applying for new group boards to increase my reach. Now, if you start getting impressions, the next step will be to convert it into clicks. If you write generic headlines, no one is going to click it because Pinterest is filled with such types of pins. So, in this crowded environment, you need to make sure that you stand out from the rest. …And how will you do it? By creating pins with a unique headline that catches attention. Headlines which creates mystery or curiosity always does well because when people read such headlines, they become excited to find out the reason behind such title. As you can see, such types of headlines create a mystery which makes you think what will be the secret. Thus, there is a higher probability that you’ll check it out. 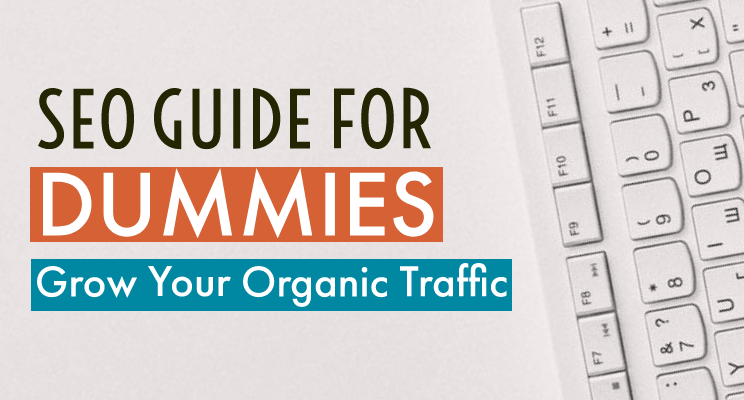 This is an additional step which can further skyrocket your traffic. Here, all you need to do is share your pins in Tailwind tribes. If you don’t know what it is, then Tailwind is a scheduling tool for Pinterest. Using this tool, you can automate your pinning activities & can reduce manual pinning. Now, Tailwind has its own group boards known as Tailwind Tribes which gives more exposure to your pins in comparison with Pinterest group boards. You will see a better result with Tailwind tribes if you decide to share your pins there. I have seen more traffic from tribes than Pinterest boards. That’s what has helped me to boost my overall traffic. So, if you want to try your hands on tribes, then I will recommend to sign-up for Tailwind by clicking here. After signing up, you will receive 100 pinning slots for free along with 10 slots for joining Tribes & 80 pinning slots per month for Tribes. You can join up to 10 Tribes. Even, if you don’t want to upgrade to their paid plans, you can still use their free plan for just using the tribes. Isn’t that great? So, that’s it, guys. This was my story of how I got an amazing result from Pinterest. Though I had to invest $39 for it, it is definitely worth it. Sometimes, it’s not about the money, it is about the result which we need. So, I am happy that I am seeing a terrific result from Pinterest.